The fighter variant of the advanced italian trainer jet made is on display at the Dubai Aishow 2017. Leonardo’s M-346FA (Fighter Attack) makes its debut at the Dubai Airshow, one of the most important global defence and aerospace events, held from 12 to 16 November. The M-346FA, for which several international air force’s have already demonstrated their interest, represents a further evolution – after the AJT (Advanced Jet Trainer) for the advanced training of military pilots and the multi-role M-346FT (Fighter Trainer) – of a family concept designed to create a common baseline, able to rapidly answer to the different requirements. Thanks to the integration of the Grifo multi-mode fire control radar, designed and manufactured by Leonardo and already chosen by several customers in the world, the M-346FA offers advanced operational capabilities. The M-346FA’s characteristics make it not only an excellent advanced trainer, but also a light fighter aircraft capable of carrying out operational missions at far lower costs than those of front-line fighters. With seven pylons for external loads, the M-346FA is able to operate very effectively as multi-role tactical aircraft, capable of air-to-surface, air-to-air and tactical reconnaissance missions. Leonardo, a world leader in the training field, offers a product portfolio able to cover the entire training syllabus, from basic-advanced training on the new M-345 into the advanced/lead-in fighter training (LIFT) phase with the M-346. 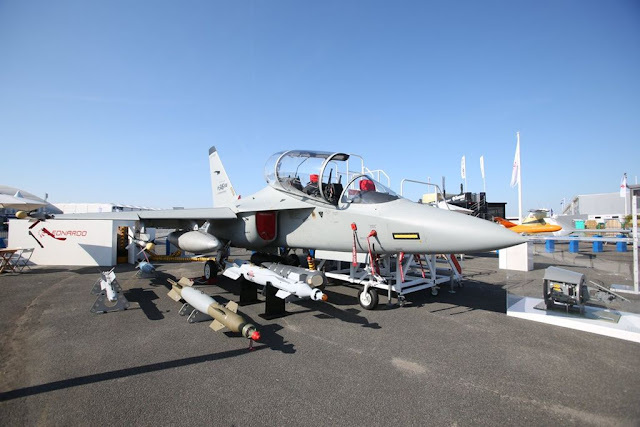 Already ordered by the Italian Air Force, the M-345 jet trainer is comparable in cost to a high-power turboprop aircraft but with higher levels of performance. A complete Ground Based Training System (GBTS), well-integrated with the platforms and able to ensure both high quality training and strong operating efficiency, complements the aerial platforms. Platforms and systems offer worldwide customers a "turnkey" training solution that can guarantee the highest quality standards at every training stage. Among the most notable examples that have integrated Leonardo products and selected them based on excellent performance characteristics is the United Arab Emirates’ national aerobatic team, Al Fursan, which uses the Aermacchi MB-339 aircraft. The Emirati pilots were trained in Italy and the UAE under the guidance of the “Frecce Tricolori” pilots using Italian aircraft and training systems.